Berrett-Koehler is on the move! 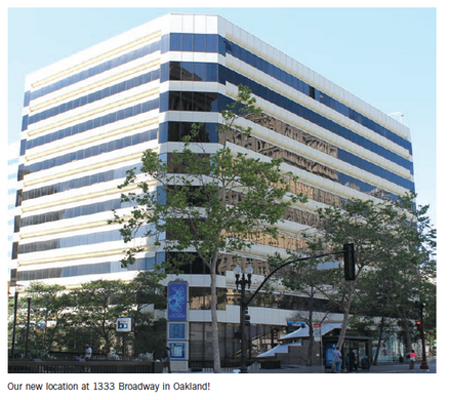 After twenty-two years in San Francisco, this October BK is moving across the Bay to beautiful new offices in Oakland. We’re thrilled to be making this move. Oakland is a diverse, vibrant, and welcoming community, and it has become a hot spot for innovation. In May the New York Times ran a front-page story titled “Oakland: Brooklyn by the Bay” that described how Oakland’s “deep cultural roots entwine working-class African-American and ethnic communities, progressive politics, arts, food, and more recently technology entrepreneurship.” “Oakland is becoming the creative engine of the Bay Area,” according to an observer quoted in the article. Oakland and neighboring Berkeley have long been home to scores of book publishing companies, including many friends of BK, such as New Harbinger Publications. Recently Oakland has become a rising tech home, and it was ranked among the most attractive cities for tech startups by a report of the National Venture Capital Association. And numerous leading nonprofits are moving to Oakland, such as a pioneer in our marketplace, Business Alliance for Local Living Economies (BALLE). Spectacular setting. We’re on the top floor of a modern, LEED Silver-certified building. Our offices enjoy commanding views of the Bay Area, including the Golden Gate Bridge, Bay Bridge, and San Francisco skyline. Close to mass transit. Our new offices are 100 feet from a BART station (the local subway), which is much closer to BART than our current offices. They’re less than fifteen minutes by BART from downtown San Francisco, less than forty-five minutes by BART from San Francisco International Airport, and less than thirty minutes by BART and shuttle bus from Oakland International Airport. And you’re delivered right to our front door. Shorter commute. Approximately two-thirds of the BK staff live in the East Bay, and nearly all of them will have a shorter daily commute to the offices. Close to accommodations. We’re two blocks from the Oakland Marriott and Convention Center, and many other hotels are nearby. Dozens of restaurants are in walking distance, ranging from quick and inexpensive to elegant. We’re very excited about this new chapter in our history. Watch our website for news about the move and for photos of our fantastic new digs! Check out our new office Contact List if you need to know our new phone numbers.